It took me 7 months before I could write something about these brushes! What took me that long? Well, ever since my friend gave these brushes, it instantly took stardom on my desk, that I forgot that I had other brushes! This is (currently) my favorite set. I use them all the time, that I didn't get a chance to take pictures whenever they are newly washed - except for today! These brushes were given to me last April. That explains the scratchy plastic cover above. I kept it because I really intended to blog it even if I didn't even had a blog at that time. I knew, the moment I first laid my hands on these that they were worth the share and the hype. The Real Techniques brushes are separated into three categories (and color coded as well). Gold for a flawless base, purple for enhanced eyes and pink for a perfect finish. The Core Collection (Gold) is intended to create a perfect base for make up. Four brushes are included in this set (The Buffing brush, Pointed Foundation Brush, Contour Brush and Detailer brush) which I will talk about individually, so please bear with me and this long post. All the brushes are densely packed and super soft. I could not stop stroking in on my face when I first had it. They are light and free standing, except for the detailer brush. These were washed several times already, and yet no shedding and bleeding occured. Back when I first had these brushes they were still not available here in the Philippines. However, I found a few online stores that sell them now. Most of them would sell these for P1500 ( a bit over priced) but I found one who gives these brushes for a reasonable value. Carefree Shopper (click the link to be directed automatically to the FB page) retails this for only P1150. If you are gonna sum up all the expenses like the shipping fee, this price is reasonable since shipping fee and tax may be a bit costly when bought overseas. *Ideal for full coverage application of powder and mineral foundation. This is the reason why I wanted this set. If only they sell it individually, I would purchase an extra one. It is perfect for cream and liquid foundation although, it goes well with other base products too. Whenever I use this brush, my make up appears as if it was airbrushed, even if the foundation that I used is a cheap drug store find. It makes applying foundation so easy! 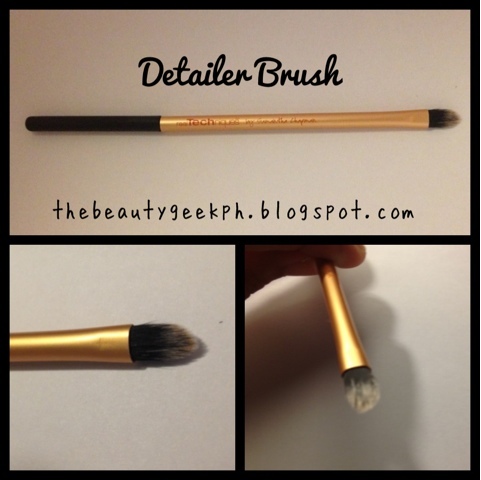 Despite being a newbie with make up, this brush helped me create a pro look. This brush helps eliminate the visibility of my pores. The size is perfect, it is not too large to put a lot of make up to waste, and yet not too small to make application take up too long. This is my favorite brush as of the moment, and no one stole the spotlight yet. *Delicately applies highlighter to contour or create sheer, soft focus finish. I have to admit, I didn't like this brush at first as I was used to the angled brush for contouring. But, when I tried this on, it became an instant favorite like my buffing brush. Unlike an angled brush, the tapered cut of this brush makes it easy to soften the lines of contouring. The size just makes it easy for you to apply it precisely on your face especially if you have a smaller frame. Didn't know that it was possible to make contouring appear natural on the face until I found this brush. *Use with liquid foundation to build custom coverage. Contrary to what the product says, I do not use it as it's purpose. I find it too small to be a foundation brush and it will take forever before I finish of my huge face when I use this in applying foundation. 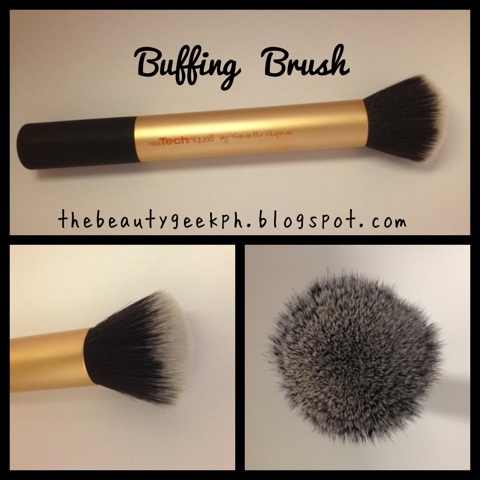 The buffing brush is just too good to be true that you wont be needing this brush for applying foundation. However, this works well as a concealer brush. The pointed shape makes it easier for you to reach the corners of your eyes and nose. It doesn't give out a scratchy feeling either when you use it. *Precision cut to effortlessly conceal problem areas; or use with lipstick for a long lasting shape and definition. I use this brush the least, among all the brushes in this set. But having this set for more than half of the year, you gotta find something special about it right? And so I did, as I use it now to highlight my brow bone. 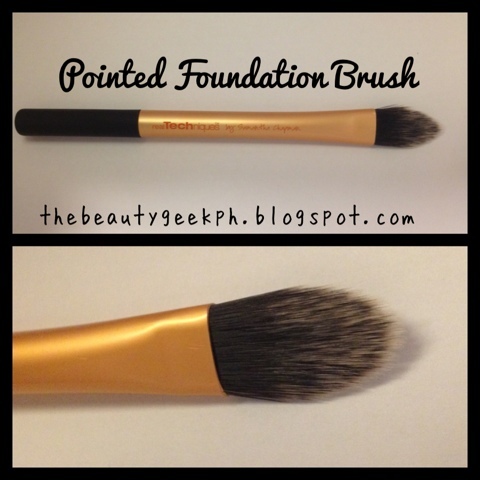 I don''t use this as a concealer brush, since I find the foundation brush more efficient in doing the job. This could also serve as a lip brush. *Dual carrier and stand keeps brushes organized on your counter or on the go. The case is one of the most interesting things that the Real Techniques brushes have. Fold it on one side and it could stand neatly on your make up station. Fold it on the other side, and you are ready to go. I don't use this on my make up stand though. I am preserving the elasticity of the garter that holds the brushes. Just kidding! Haha! I find it a hassle to shoot them on the garter so I opt to use the acrylic stands I have as it is more convenient and easy to pull out and put the brushes back. I also don't use this case for travel, because the little knob on the toggle deforms my brush when you fold it close. I prefer a brush roll when travelling, because it secures the brushes more than this kind of case. But, I love this case for another reason! I use it to dry my brushes! How? I just place them upside down to allow the water to drip! Similar to the use of the Sigma Dry n' Shape (I think so! haha). Although the Dry n' Shape is still on my wishlist. I have yet to prove my assumption when I get to purchase one already haha. Very affordable! The price of the set is actually worth it even for the buffing brush alone. Versatile! I would love to call these the MacGyver brushes because you could use them in so many ways than the ones intended for it. Unlike other ferules of brushes, these ones are made of aluminum rather than wood. It's an advantage, since wood expands with water. When we wash our brushes with wooden ferules, it may cause permanent damage to our brushes. That's the reason why we try as much not to let water touch the ferules when cleaning. It is made of synthetic taklon bristles, which means no animal was harmed in the process of making these brushes. The taklon bristles also makes it dry up faster than the brushes with real animal hair. The white bristles on top makes it easier to see if the brushes are in need of cleaning already. 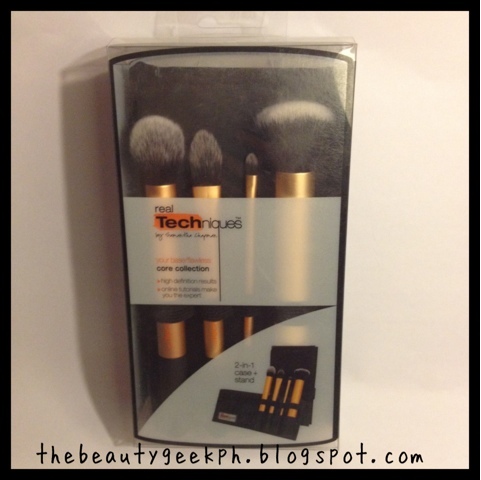 I have no qualms about these brushes except that it is not available locally except through online stores. I recently had a bad experience from an on-line store (they sold me fake Eco Tools brushes which I will blog about sometime soon), that explains why I am hesitant over buying on-line. I will in a heartbeat if I have extra money. 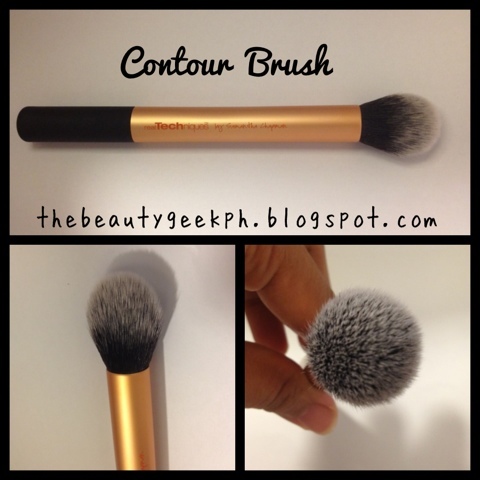 The buffing brush and contour brush is worth a repurchase, especially if you are the kind who separates make up brushes for you clients and those for personal use. These are quality brushes that won't burn your pockets. I still could not believe how much it costs because of the quality it gives. 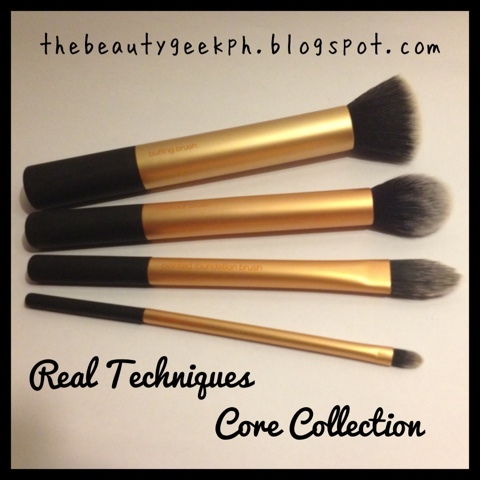 I have always wanted to blog about this ever since I started The Beauty Geek, but the brushes never had the chance to rest for pictures as they currently are my go to brushes. Whenever it dries after cleaning, I use them right away. They were that essential to my make up routine. It goes to show that these are my favorite brushes. And that's about the rest of it! It is getting a bit long and I think I am boring you out already. hehe. I hope this has been helpful if you are deciding whether or not you will purchase Real Techniques. I still have another set up for blogging and I might do it this week so keep posted! Would love to hear a thing or two from you ladies! By the way, what do you think about my new way of posting pictures? Would you believe that they were just taken from my trusty phone? I learned something today from a fellow blogger Carla Samson about how to enhance pictures using a DIY light tent. Really amazing! Anyway that is it for now! Hope you enjoyed this post! OMG! i've been wanting these brushes for ages!!!! I don't get why its much cheaper in America seeing as though Pixiwoo are brirish its about £22 here roughly P1441.29 But oh well one day those babies will be mine! 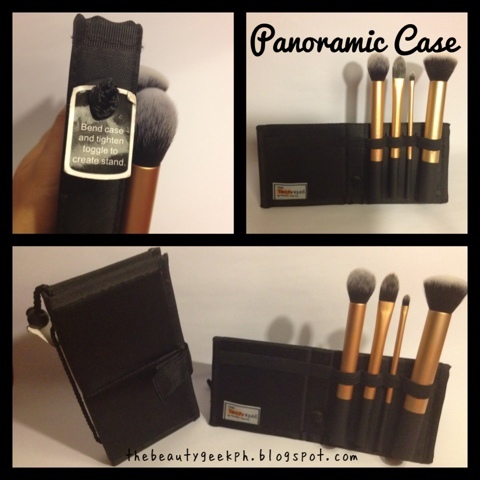 Great review, its the best one I've seen for these brushes. i enjoyed reading ur blog...its informative and awesome!! followed u on gfc..
Hope u can follow me back..